New York : Chicken House/Scholastic, 2008. When Will Burrows and his friend Chester embark on a quest to find Will&apos;s archaeologist father, who has inexplicably disappeared, they are led to a labyrinthine world underneath London, full of sinister inhabitants with evil intentions toward "Topsoilers" like Will and his father. 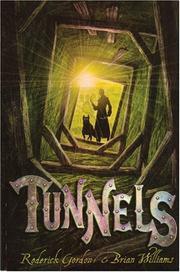 Tunnels / by Roderick Gordon and Brian Williams. Accelerated Reader MG 7.0 20 Test #120835 BGMS. AR MG 7.0 20 Test #120835 BGMS. 100 ME:PersonalName 1 $a Personal name Gordon, Roderick. $c Statement of responsibility by Roderick Gordon and Brian Williams. 250 Edition $a Edition statement 1st American ed. $c Date of publication, dist, etc 2008. 520 Summary $a Summary, etc. note When Will Burrows and his friend Chester embark on a quest to find Will&apos;s archaeologist father, who has inexplicably disappeared, they are led to a labyrinthine world underneath London, full of sinister inhabitants with evil intentions toward "Topsoilers" like Will and his father. 650 Subj:Topic 8 $a Topical term Adventure fiction.